Tokushima Prefecture is situated on the eastern side of Shikoku and the prefectural capital is Tokushima City. Its is connected to mainland Japan by the Akashi-Kaikyo and Naruto Bridges, and can be reached from Osaka in two and a half hours. 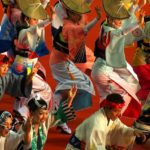 The prefecture is best known for the Awa Odori, a dance festival held in August, the whirlpools of Naruto and the scenic Iya Valley.